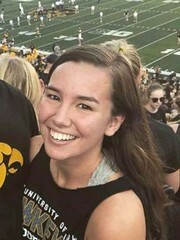 Can you help locate and bring home Mollie Tibbetts who was last seen on July 18th 2018. This story like all the others about a missing person hits home that this could happen to anybody, your sister, your daughter or any other family member or friend. I'm sure you will agree that this is a very worrying story that people need answers for but most importantly the return home of Mollie. If you have any intuition or ability please use it to help Mollie and add to this thread. You may just want to add your thoughts as I will start off here very briefly as I am a bit stuck on this case myself. I had a look over her instagram account and it may be nothing but I noticed that in her most recent uploaded picture dated July 12th 2018 that Mollie looks more serious in this picture compared to other pictures of her. As I said it may be nothing other than just being tired but it also raises another possibility that she had an added stress or problem or a heavy heart at that time. I think it would be the biggest highlight of this forum ever if gifted people would contribute and help bring Mollie home. 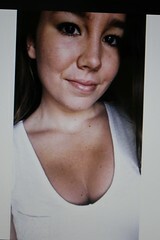 Please take the time to go over Mollie's case and make an effort to bring her home. Edited by rainmaker, 02 August 2018 - 03:36 AM. My thoughts are, I hope she returns home safely but that isn't what my gut is saying. Sorry, I couldn't find the picture you were talking about Vern. Let's hope the reported sightings turn into something good and she is found. Thanks for sharing, it would be terrible for her family and friends not to know what happened to her. Any awareness of the situation is a good thing so people can be aware. I don't have anything specific to add to this that would be in any way constructive, so I'll keep the rest of my thoughts to myself and hope they locate her soon. It seems at least from the news I have read it is still not 100% clear that Mollie returned home from her jog to her boyfriends place where she was dog sitting. A red shirt has been found but not yet confirmed to be hers although the news article mentions that the red shirt found in the ditch has the logo GRMC DAY CAMP which they say Mollie would have worn to work. The two dogs were found locked in the basement unharmed which is where I have read Mollie would have locked them when out for a run. I wonder if this is where Mollie would put the dogs when she went to work? that information might help if she would put them elsewhere. I wonder if Mollie returned home after her run or others have made it look like she returned home. In pondering that question one might think if a person or people she knew could be connected to her disappearance how would they think going missing from the home might direct suspicion away from them, that seems odd to me. At this stage I am more inclined to believe this was planned and not random. Edited by rainmaker, 04 August 2018 - 01:11 AM. As time marches on in these cases it seems the window for a positive outcome starts to close although I am holding out hope that Mollie will be found soon. Investigators are remaining tight lipped on the case but I am not aware of anything that Mollie wore on her run having been found back at her boyfriends house or elsewhere. It was reported she also had her phone and some ear buds and a fitbit while out for a jog but none of these has been reported as been found. It had been reported early on that her laptop had been used for home work which seemed to link her to returning home after her run although this seems doubtful as the dogs were found locked in the basement where she would put them while out for a jog. Also after a sweaty 45 minute run you would expect to want to strip off and hit the shower before getting settled down to doing much else apart from letting the dogs out and getting a cold drink. I heard another theory that Mollie might have been struck by a car while out running and perhaps pulled into the car by the driver. Almost anything remains possible for now. I would not be surprised to find that someone very close to Mollie is responsible for her disappearance. Some of the body language in the interviews seems odd. Unfortunately there is nothing new to report although that does not mean law enforcement are not making progress to find Mollie, I am fairly sure progress has been made and investigators are remaining tight lipped for whatever reason. Mollie has a pinned tweet about been mistaken for a missing child in November 2017. It's not really of help in finding Mollie but I have been wondering if that tweet may have seeded an idea for someone in Mollie's social media circle. It is probably a long shot and not of much use but most times ideas that then are acted out in reality are more often than not seeded at the very start with an idea. I would think law enforcement are clever enough to have spotted this early on and will be checking back on Mollie's messages and if possible the messages of people who visited her pages since 14th November 2017. Also it is reported that Mollie never took off her FitBit so the information there for investigators will be if and when did Mollie's heart rate spike on a probable abduction. It is also reported Mollie had her phone with her as well as her FitBit while out for her run so as long as they had battery power and it was not in a dead zone with no signal investigators should have a good idea where she was taken / picked up from. Mollie's case brings light to so many other missing people out there in the world that also need locating. It is also an important reminder to not live in fear but take precautions to lessen the chance of becoming a victim. If you should ever find yourself in danger use your voice to alert others and be as loud as you can, God gave you lungs for a reason and get as much distance as you can between yourself and them. I would personally recommend everybody make the effort to learn self defense well to use in a last resort situation. I was pleased I had done some as a youngster when three guys started attacking a small male and female friend of mine many years ago outside a pizza restaurant I was able to intervene and see them off. Edited by rainmaker, 19 August 2018 - 02:29 AM. Unfortunately far to many people go missing every day. So if you like helping others and have a gift or just like trying to piece together with the hope of solving cases like these, you may want to consider looking up and joining a Sleuthing forum where you can give it a try. I feel gutted as all I got from this was some intuition that big news was incoming on the case a couple of hours beforehand which I mentioned on a Sleuthing forum but for me I feel this is just not good enough. Thanks for the update it was sad news let's now try to celebrate her life and send out positive energy for her instead of getting dug-down in the negative. I felt she wasn't with us but beyond that, I had nothing else.